I have one window in my home that gets decent light. I mean, enough light to place plants in and they will actually grow. All the other windows on any other side of the house are just a lost cause. But the good side, the best side, has one perfectly placed window. We sure get our mileage out of it. Last time I checked, we had eleven plants absorbing the sun's rays through it each and every day. Yes, eleven. Some hanging, several on the window sill and some on a table we slid as close as we could to maximize our efforts. Soon to join the club is this little guy. Yes, that is an avocado seed. And I am working on sprouting it right now. Actually, my kids are. I had my Avoseedo sprouting kit sitting on the counter next to some avocados that were in the process of ripening. Once they were ripened, my kids whipped up some guacamole. I heard them slicing and dicing in the kitchen and when I came back in I saw a bowl of water on the counter with a peeled avocado seed resting in it. They said they hoped I didn't mind! They read the instructions and did exactly what it said. I was impressed. I didn't give them a hard time about it since I know they are excited to see this seed grow into a tree. We've tried it before but to no avail. Of course, we didn't peel the seed nor did we have an Avoseedo at the time either! 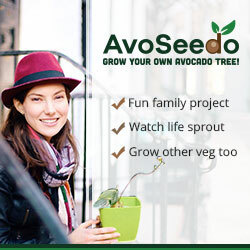 AvoSeedo is an avocado tree germinator with a bowl that makes it easy for everyone to grow their own plant at home from a simple avocado pit. Have you ever tried to sprout an avocado seed before? It is not easy. Let me tell you of the times we have had seed after seed sitting around our house. Sitting in water. Waiting for germination. I always hated throwing the seed out but when the water would get all full of mildew, I was done. I would throw it away and hope for the best the next time around. Now I don't need to sit around with my fingers crossed. The Avoseedo has the process down to a science. -Reusable for other vegetables like lettuce, celery, carrot tops! Disclaimer: I received the above product for the purpose of this review. All thoughts and opinions are my own.